We stop hiking when the general deer hunting season starts, so this event was intended to be the last scheduled Cache Hiker activity of the 2015 season. Our route would include more than 2 miles on backcountry roads, so we hoped the Sunday date would mean less vehicle traffic. Dave W was the substitute leader since Jim would be out of town. 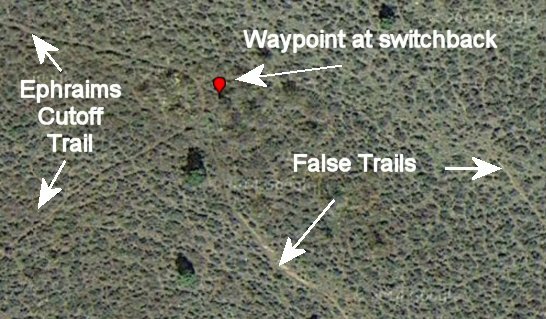 Cattle and trail users had obscured switchbacks where the Ephraim's Cutoff Trail comes down to the Long Hollow road, so Dave drove to Ephraims Grave a few days earlier and hiked up the trail to make GPS waypoints (see below). On Sunday morning, Dave W. went to our usual meeting place, but nobody came! Perhaps people are tired of hiking this late in the fall, they may have been intimidated by this strenuous and long hike (12 miles with 2500 feet elevation gain), or they may not have know about it since the Herald Journal failed to list the activity in Friday's newspaper. Trail Notes: The switchbacks on Ephraims Cutoff Trail could use some brushing work to encourage hikers to stay on the right path.